Over 60% of marketers are using webinars as part of their content marketing programs. And according to research done by ReadyTalk, email is the number one way companies promote their webinars. Not surprising to me since email still beats out social media and other forms of promotion in every single study out there. Plus an email inbox is someone’s digital living room: if you can get your message there, they’re more likely to listen. When you have webinars in place in your marketing and sales cycles, they’re one of the main ways that potential customers join your email list and start hearing from you on a regular basis. Think about it: you offer a compelling topic, promote it to your list and/or partner with another brand to reach out to their list as well, and you’ve got a list-building, customer-building, retention-building tool on your hands. Back when I worked at ConvertKit, I was leading all of the content marketing which did its job in driving traffic to our website. Content marketing alone wasn’t enough to reach our goals but we didn’t exactly have a big budget to throw a bunch of money at Facebook ads. So we got creative and ran webinars. After 150 webinars, ConvertKit saw a 637% growth in monthly revenue. Webinars work… when they’re done right. And a huge part of your webinar strategy needs to be the email strategy that goes around those webinars. 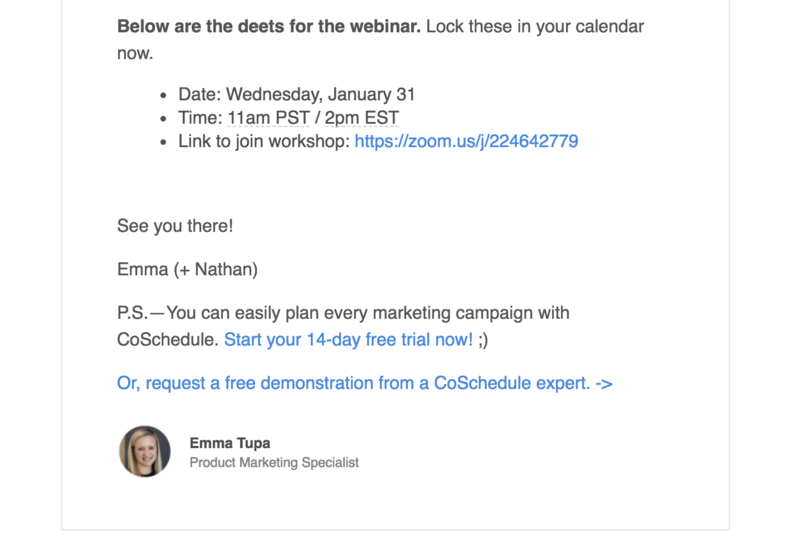 CoSchedule has beautifully built webinars into their marketing strategy and they have the emails to show for it. This isn’t a haphazard sequence. It’s well thought out, perfectly timed, and full of swipeable elements. And, yes, a few opportunities for improvement. Well, when you look at them right next to each other in the inbox you can’t help but focus on that word. TBH, it’s one of my least favorite sales/marketing words. Maybe it’s because I had a boss who said it all the time about everything. Maybe it’s because I’m a copywriter and there are much better word choices out there. Maybe it’s because I’m easily scared. IDK. All I know is that it stands out to me and now it probably does to you too. 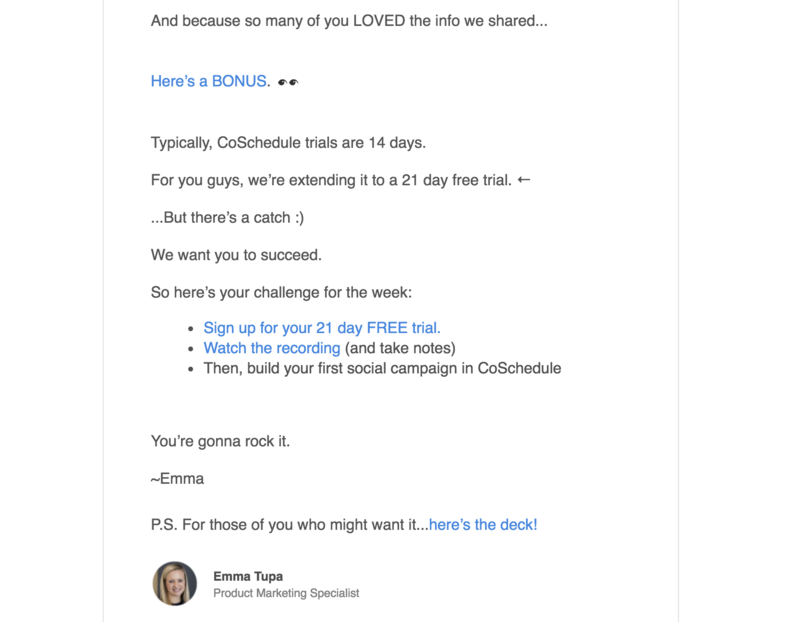 Nevertheless, the first email I got from Emma (I was already on the CoSchedule email list here) was an invite to register for the upcoming webinar event. If you want to infuse your emails with personality and make the reader feel close to you, please write the way you talk. Sure, it might feel a little too familiar for some. So check it all against your brand, of course. 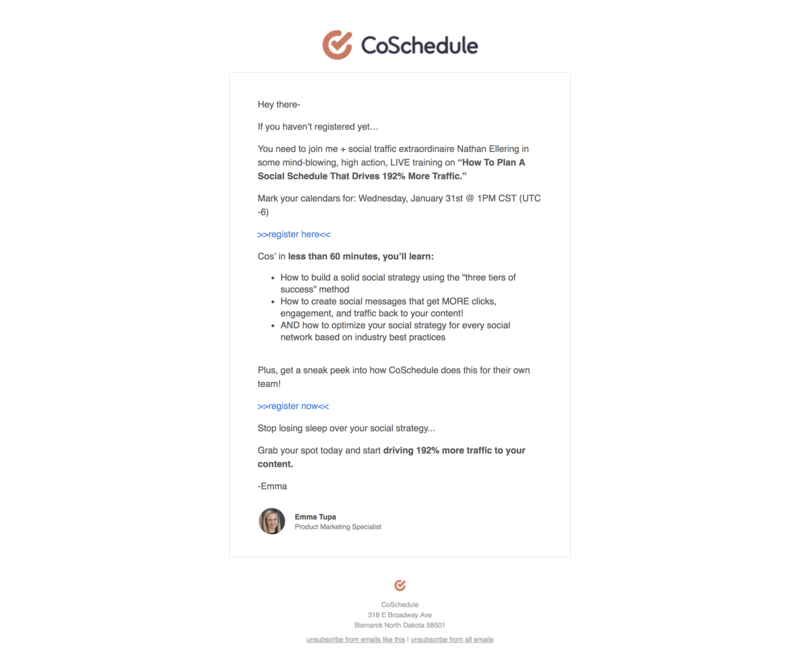 But in CoSchedule’s case they take a very familiar tone with their copywriting so this message lands just as expected. That’s all this email needs to do – get them to register. This confirmation email takes the elements from the previous email and flips it. I’m in now. I’m one of the gang. I’m going to get everything I was promised. Nothing says Automated Marketing Email like a full name in that line. And while it takes a little extra effort, many email marketing services offer a way to remove that last name if it’s in the imported field. as your liquid text in the merge tag to ensure that the first name is capitalized and that the last name is removed. Pro Tip: Check with your own email provider before inserting merge tags copied from other places to be sure it will work in that system! Thing is… I already had a trial. While I didn’t convert, I doubt that CoSchedule is going to let me have another free trial. So this is a dead giveaway that there’s room for deeper personalization here. The PS could be personalized based on my account history, inviting me to upgrade to a paid account if I have a free trial already or simply pointing me toward that expert demo since I’ve already given the trial a go. As with everything in marketing today, personalization matters. Tiny details are big details. They are what connect and convert. They’re the stickiness of your future customers. Spend time on the details. They matter. I love it when people remind me of things in the most succinct way possible. No morning email, hour before, 10 minutes before, at the hour make-me-crazy email sequence. Thanks for knowing that, Emma. Do you see the opportunity for personalization? Now, I know that Zoom Webinars (the webinar platform of choice for CoSchedule) doesn’t allow you as the host to know who came to the event live and who didn’t. So this kind of personalization does require a more robust webinar platform. 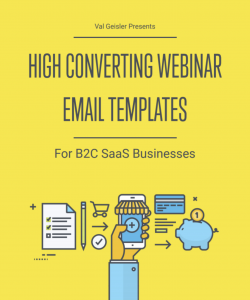 But if it’s possible with your webinar software, you absolutely should send two different emails (or two different sections of content based on tags) for those who attended and those who didn’t. 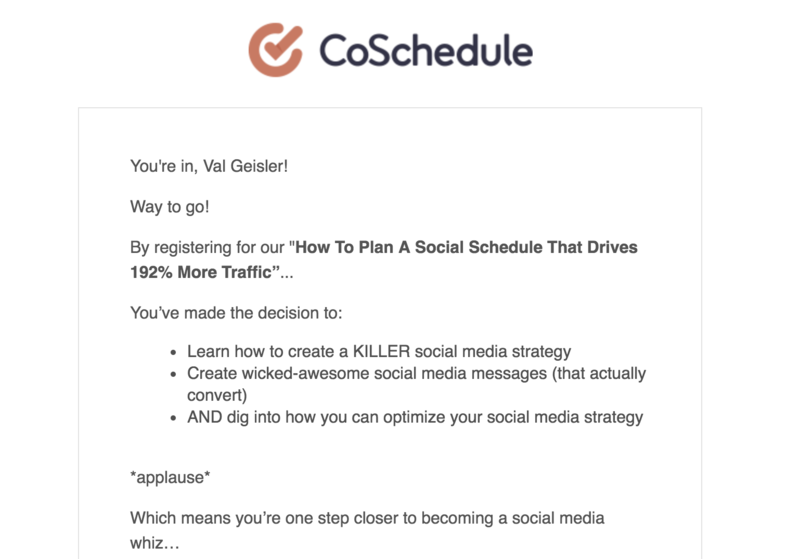 Just like we talked about for the email prior to the webinar, it would be SO GREAT if CoSchedule personalized this bonus based on my history with the platform. See how that can help a reader connect and feel like they matter? Last thing (and this is super picky but, well, that’s why we’re here) is that when you’re referring to a slide deck, call it that. “Slide deck”. Just “deck” (see it in the PS?) is confusing jargon if you aren’t familiar with it. And when you’re confused you feel alienated. Couple that with missing personalization and a simple missing word can truly drive people away. An invite to the next webinar and a reminder about that recording and bonus. Again, being picky here, the only thing that changed in the reminder email was adding “^bump” to the subject line. Since the preview text picks up the first few lines of the email if you don’t have a preview text field completed (ahem), you’ll want to adjust that initial text so it doesn’t sound like a broken record. 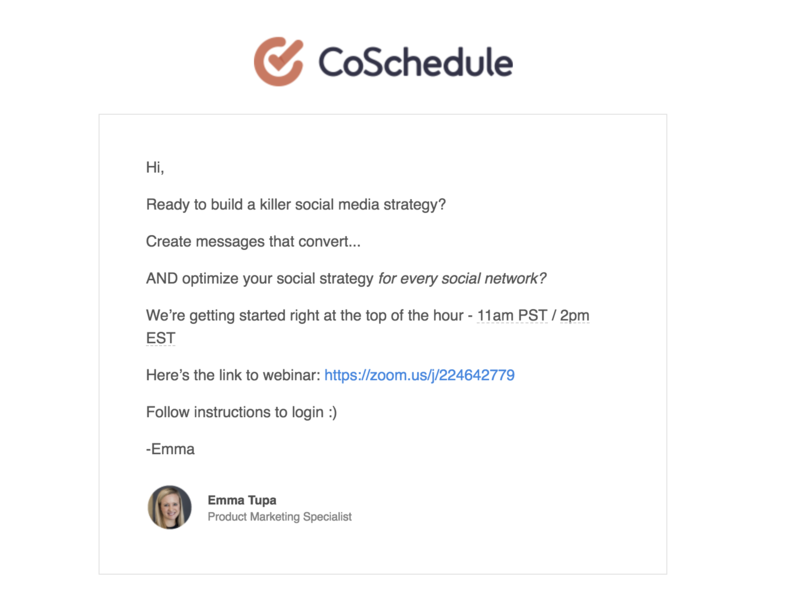 CoSchedule does so many things right with this email onboarding sequence for their webinar. It goes beyond onboarding to the webinar. It’s about delivering the attendees what they signed up for. So now you’re probably wondering how you can create the same impact for your own webinars. How you can write effective emails after you’re exhausted from creating the webinar itself. Don’t worry though. I have just the thing for you. Overall CoSchedule has some really strong webinar emails here. And you can swipe their copy or….get your own ready to go swipe copy by clicking right here! 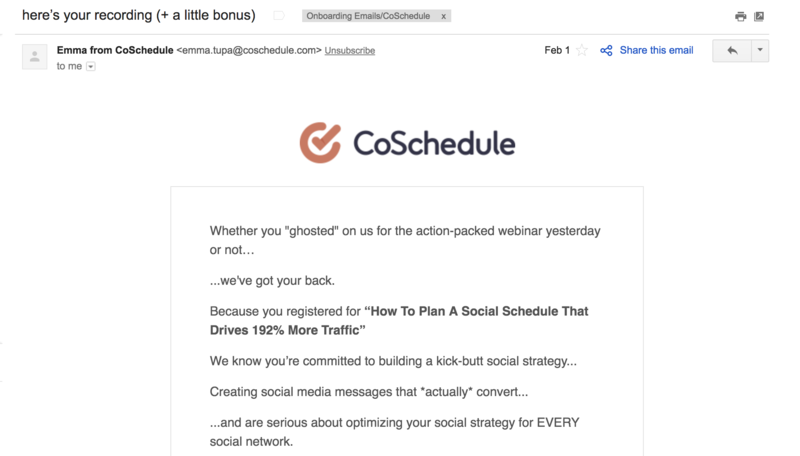 What are your biggest takeaways from CoSchedule’s webinar onboarding emails?